GOLD STOCK STRATEGIST: Gold Resource Corp.
Gold Resource Corporation is a mining company headquartered in Denver, Colorado and focused on production and pursuing development of select, high-grade gold and silver projects that feature low operation costs and produce high returns on capital. The Company has 100% interest in four high-grade gold and silver properties in Mexico's southern state of Oaxaca. Construction is underway at the Company's flagship property, its El Aguila Project, targeting gold production the last half of 2008. The El Aguila project is a 100% owned high-grade gold, silver, lead, zinc, copper system that will initially be mined as an open pit project. Surface samples have yielded high grades including grades of up to 36 g/t gold and a 3,100 g/t silver. The other three properties are also 100% owned--El Rey (gold, silver), Las Margaritas (silver, gold), and Solaga (silver, gold). All four properties will be logistically close enough to feed their 1,000 tpd mill (850 tpd flotation and 150 tpd agitated leach) producing dore and concentrate. Gold Resource is one of those rule breaker companies that defy traditional analysis as they do not have an estimate of proven and probable reserves compliant with SEC rules. The main reason they haven’t gone to the trouble to prove up the resource is that they are not seeking loans to develop the project. Rather than go through the expensive process of formally defining the extent of the resource, they have conducted several detailed technical studies of the drill results from deposits at El Aguila. You will notice that Gold Resource issues many more press releases of their drill results than other emerging junior gold producers as a way of keeping their investors informed of the expansion of the resource. 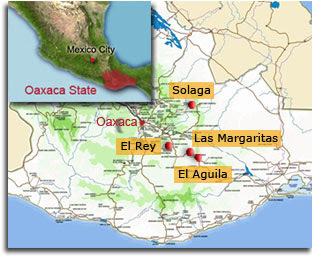 El Aguila performed a scoping study in 2004. A scoping study is the first level of study that is performed on a mineral deposit to determine its economic viability. This is usually performed to determine whether the expense of a full pre-feasibility study and later full feasibility is warranted. The combination of a scoping study and continued promising drill results have given Gold Resource management the confidence that sufficient mineralization exists to move into production quickly. The current plan is to move into production in the 2nd half of 2008. According to Gold Resource, they believe they have a potential total of 2M oz of gold equivalent resources along 2 kilometers in the El Aguila project. The lack of compliant reserve base creates one more problem in valuing Gold Resource. As a result, and unlike companies with measured compliant resource estimates, the valuation of Gold Resource based on projected production is much higher than valuation based on reserves/resources. Gold Resource production is not hedged, has no debt, and has no warrants outstanding. Cash currently available as of January 2008 = ~$22,000,000. This is plenty of cash to move the company into production. It doesn't seem necessary for management to issue further shares to finance development and production. One-third of the shares are owned by management, one-third owned by institutions, and one-third by retail shareholders. Management has also indicated they are interested in paying a dividend equal to one-third of earnings once they reach a steady state of production. Management projects production will be 70,000 oz. gold equivalent in the first full year building up to 120,000 oz. when up to full production in the third year. For purposes of modeling, Gold Resource production is projected to be 20,000 oz. in 2008; 70,000 oz.in 2009; 90,000 oz. in 2010. Management has a solid record of experience in mining and so far have executed well with Gold Resource Corp. The following valuation methods are what I use to value Gold Resource for my investment purposes and provide a range of short-run and potential long-run value. Of course, different assumptions would produce different valuations. The reader can assess the reasonableness of the assumptions. $5.88 per share if Gold Resources 783,000 oz. gold equivalent is accurate. It could be worth a great deal more if El Aquila delivers on management’s estimate of 2 million oz. gold equivalent. If the other three properties prove up, the potential value is much higher. The majors are paying about $280 an ounce for buyouts at $950 an ounce POG. 783,000 times $280 an ounce equals $216 million. $216 million divided by 36.8 million shares (fully diluted) equals $5.88 per share. Full disclosure: I do not own shares in Gold Resources. The information provided in this post is believed to be correct, but not guaranteed. Investing in junior gold miners entails risks. Readers are responsible for their own investment decisions. Do your own due diligence. This is my top holding. I like the management, its shareholder friendly attitude and the rocks (high-grade, pretty near the surface). At this point a 2008 start of production seems a little dubious to me and I wish the permits (which have been due any day since January) were in.